Home Alone 3 is a 1997 American family comedy film written and produced by John Hughes. 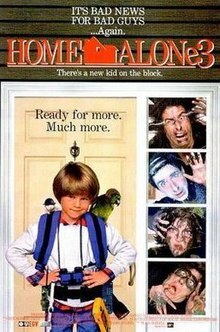 It is the third film in the Home Alone series and the first not to feature actor Macaulay Culkin and the cast from the previous films, director Chris Columbus, and composer John Williams. The film is directed by Raja Gosnell (in his directorial debut), who served as the editor of both original films and stars Alex D. Linz as Alex Pruitt, an 8-year-old child prodigy who defends his home from a band of criminals working for a North Korean terrorist organization. The thieves conclude that Alex has been watching them and decide to pursue him. As a snowstorm hits Chicago, the thieves block off the road to the house. Alice and Beaupre trick Mrs. Hess into leading them to her garage. Alice duct tapes her to a chair and leaves the back door open. By this point, Alex has rigged his house with booby traps and prepares to set them off with his pet rat, Doris, and his brother's loud-mouthed parrot. After their numerous break-in attempts are foiled by Alex's traps, the thieves infiltrate the house and search for Alex. Alex flees to the attic and takes the dumbwaiter down to the basement, then runs outside and calls to Alice, Jernigan, and Unger. The thieves see Alex and notice a trampoline below them. Jernigan and Unger jump to pursue Alex, but the trampoline gives way and they fall into a frozen pool. Alice wriggles her way into the dumbwaiter chute but falls down to the basement because Alex removed the bottom. Alex is cornered by Beaupre while trying to rescue Mrs. Hess, but scares him off with a bubble gun resembling a Glock. Meanwhile, Federal Bureau of Investigation (FBI) agents arrive at Alex's siblings' school, after being tipped off by the recruitment center. Alex's family brings the agents to their house, where the police arrive and arrest Alice, Jernigan, and Unger. However, Beaupre flees to the snow fort in the backyard. The parrot drives the remote control car into the snow fort and threatens to light fireworks, which are lined around the inside. Beaupre offers a cracker, but the parrot demands two. Since he only has one, the parrot then lights the fireworks and flees. Beaupre is discovered and arrested. Fox Family Films was the division of 20th Century Fox responsible for production the film.